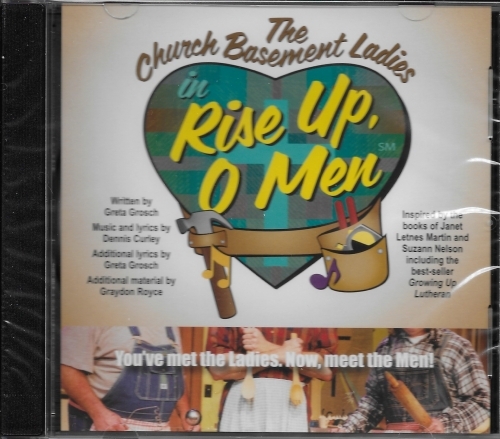 Featuring “Those Lutheran Ladies,” David Cook and Greta Grosch. To these two women the phrase, “working out,” means being a hired hand on a farm, or working at the nursing home in town. Myrtle and Emil’s Mrs. just don’t get it, but they try! Like typical Norwegian-American women of a former era, Myrtle and Ethel don’t have time to fool around exercising. They get plenty of that by just existing: dusting everything in sight both inside and out, “putting up,” serving at funerals, rolling lefse, cleaning the church, and feeding the menfolk’s bottomless pits. If you need a good laugh, or know someone who does, this DVD will handle the situation. If you want to give a total “Jiggle Your Jell-O” Gift Package, add the T-shirt.